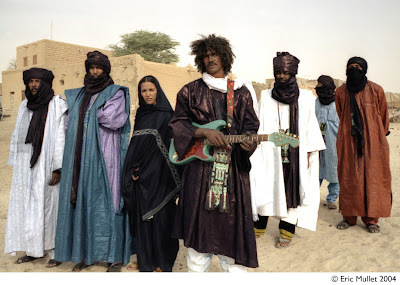 To Manchester (50 mins by car up the M6) to see Tinariwen, a Touareg group touring the UK. The sound superficially resembles Ali Farka Toure, with the Moorish trills and arabesques that characterise his guitar playing (and link his sound across the Sahara to flamenco). However, with five guitarists, an ululating female singer, electric bass and Djembe/calabash, the ensemble produce a broader and more intricate whole. Something about the rhythm is different too; on some of the numbers I simply couldn't work out the time signature (I usually can for western music, jazz etc). The closest I could approximate is a syncopated 6/8 time, with a strange delay effect created between the two sets of triple beats. The effect is nomadic; the rhythm of the camel. They sing in Tamashek and arabic (there was even a Tamashek rap-griot number at one point). The new album, Water is Life, is in part an account of the suffering the Touareg during the drought of recent years. They're keen to support the continuing use of the Tamashek script, tifinar - it features on their album artwork (see image below). It is apparently one of the oldest continuously used scripts on the planet. A beautiful script for mesmeric music. They are at the Barbican in London tomorrow.. They're really great. Tosin and I heard them at WOMAD a couple of years back and were impressed. My father has their albums and loves them. These people are such resplendent folk, aren't they? I don't know where you got the photo of the 'tifinagh' characters... because that is NOT tifinagh. It sure looks a bit like it though. Interesting. Check out this page to get a real glimpse.